Dryland salinity in Western Australia’s agricultural areas is now estimated to directly affect up to 2 million hectares and cost over half a billion dollars a year in lost agricultural production. 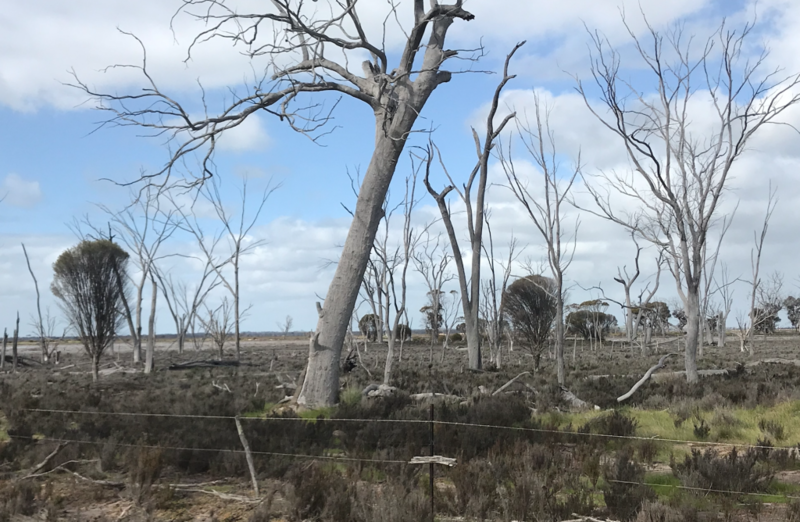 With few exceptions, the south-west’s rivers also suffer from increasing salinity levels and much of the wheatbelt’s remaining biodiversity is being severely damaged by the spreading salt. And the effects of salinising land and water are not only economic and environmental: areas more affected by dryland salinity have an elevated risk of hospitalisations for depression. Yet since 2008 Western Australian government agencies have failed to deliver remedial programs or any meaningful monitoring and evaluation of salinity’s ongoing spread. 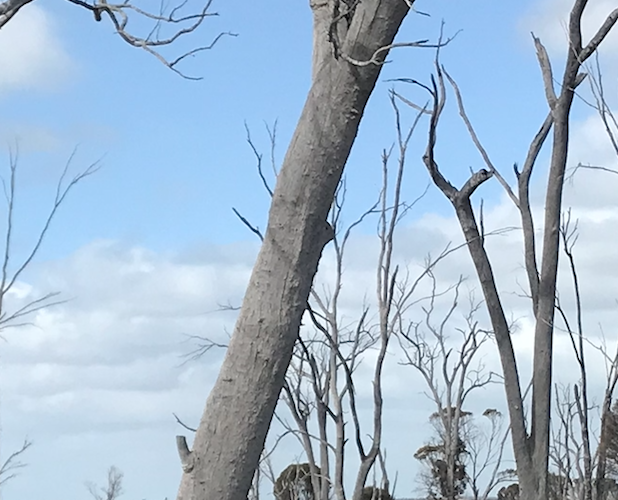 In May this year the Western Australian Office of the Auditor-General found that when it comes to salinity, ‘agencies are not meeting wider legislated responsibilities to prevent and mitigate land degradation, and protect water resources and biodiversity throughout the South West’. While noting some success in protecting high value assets in particular areas, the report makes it clear that the state doesn’t even have the information it needs to effectively manage salinity. This is a long term failure of government. 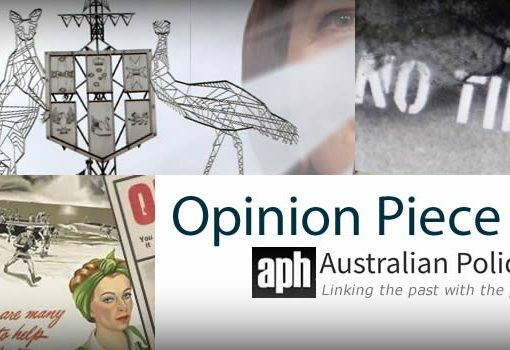 While the issue attracts periodic action, the response from Western Australia’s political and departmental heads over the last century has been dominated by a mixture of apathy and denial, and this seems to be continuing. The relationship between clearing and salinity was recognised in Western Australia before 1897. In the 1910s, scientists studying the salinity of soils in the wheatbelt and beyond had their findings dismissed as ‘scientific prejudice’. By 1924 a ‘Special Committee on Salinity in Soils’ had been established ‘with a view to seeking for the cause or causes and means of prevention or cure’. They got sidetracked and abandoned the study, while successive Western Australian governments vigorously encouraged the clearing of another 16 million hectares (almost 40 million acres) of bushland for agricultural development in full knowledge that most of the streams and much of the land would become saline. Agricultural development was an important and popular policy, and built much of WA’s early wealth, but governments rarely considered the need for a more cautious approach. As land was sold and turned into farms with little consideration given to the likely future spread of salinity, the problem has become harder to address. Salinity can take years or even decades to manifest fully, and the foreseen but slowly developing crisis has been relatively easy to ignore. Archival documents we have examined clearly demonstrate that for many decades, the WA government wavered between suppressing information on the incidence and spread of salinity, and denying its seriousness. For example, in 1928 salt appeared on the farm of a soldier settler in the Eastern Wheatbelt. The Agricultural Bank recommended that the block be re-classified (entailing the writing down of value and hence debt). The Surveyor-General rejected this recommendation because he feared the state ‘would be inundated with similar applications from other selectors who have taken up land in the vicinity’. The Agricultural Bank had already written down several accounts in the area and anticipated ‘more trouble … as clearing operations extend’. Similarly, in 1930, the General Manager of the Agricultural Bank reported to the Minister for Lands that several settlers were unable to grow crops due to excessive soil salinity. The Minister replied that he did ‘not think that too much publicity should be given to the matter’. In the 1930s and 1940s agricultural scientists, L.J.H. Teakle and G.H. Burvill explained and publicised the hydrology – and seriousness – of salinity in the wheatbelt. Yet between 1948 and 1969 successive Western Australian governments sold off an average of 400,000 hectares (a million acres) of land for agriculture every year, and the issue continued to be denied and suppressed. In the mid-1960s Dorothy Hewett wrote in ‘Legend of the Green Country’ about her father’s efforts to tackle salinity on their farm, near Wickepin. At this time, the Minister for Agriculture said it was likely that more than 50 per cent of the native vegetation would have to be retained to prevent water tables from rising. He thought it was illogical to stop clearing, as some salt encroachment would most likely occur anyway. it behooves us to be very careful indeed as surveys in 1955 and 1962 show that the used farming land which had become salt affected amounted to 186,000 acres and 305,000 acres respectively. The situation after 12 years will be appreciably worse. Yes, I am most concerned over the precedent, which will be established [if we agree to replace saline with arable land]. In the river catchments of the wetter south-west, where government had a direct economic interest in protecting its potable water supplies, it still took 25 years of internal pressure from Public Works Department scientists and others before rigid clearing controls were introduced, from 1976 onwards. It would be the mid-1990s before government started fully acknowledging the extent of the problem. By then the science was well accepted and the predictions of ongoing damage frightening. The Decade of Landcare had seen farmers mobilised like never before, and the early 1990s saw a flurry of reports and strategies. In 1996 the Court Government declared ‘War on Salinity’ and agency budgets were increased. A Situation Statement and Action Plan were developed, refined and actioned. When the ALP came to power in 2001 they allocated additional funds to salinity research and remediation. Soon after, the federal government launched its National Action Plan for Salinity and Water Quality. Western Australia was a significant beneficiary. For a while it appeared that the tables had been turned and there was real political will to tackle the creeping menace. However, the change was short-lived. Under Kevin Rudd’s ‘Caring for our Country’ program, federal funding for salinity declined steeply after 2008, and in Western Australia Colin Barnett’s new coalition government dropped salinity from its list of priorities. Departmental hydrologists who had been focused on solutions to salinity were diverted north to search for potable water under pastoral leases, and the state progressively withdraw agency support for local landcare groups. Advisory and consultative bodies, who had driven development of the earlier ‘war on salinity’, were closed down, and the Commissioner for Soil Conservation, who in the early 1990s drew on the work of 24 staff, was left with two. Not surprisingly, the number of landcare groups in farming areas has also declined. Despite being left effectively stranded by this wholesale withdrawal of government support, individual farmers, and those landcare groups who survived the cutbacks, have continued to undertake some excellent and innovative work in tackling salinity and other severe degradation problems. There has been widespread adoption of higher water use farming systems, big gains made in development of saltland pasture systems, and many farmers have invested heavily in relatively unproven drainage systems. But overall, we don’t know what’s working well and what isn’t. The Auditor–General found that ‘The last satellite imagery analysis that mapped salinity was in 2000 [when] severely salt affected land was increasing by 14,000 hectares per year. The Department does not know if this rate of increase has continued, decreased or accelerated.’ Perhaps even more significantly for the taxpayer, they also found that it wasn’t clear ‘how effective the $560 million investment of state and federal funds between 2003 and 2008 was because agencies have not continued to monitor and evaluate outcomes’. The sad reality is that the twelve year period during which successive state governments did attempt to tackle salinity was an anomaly. The past ten years has been more like the 100 years prior to 1996, when government wilfully denied the serious degradation issues facing agricultural areas. The state bears significant responsibility for these problems, having encouraged and assisted farmers – in full knowledge of the likely outcome – onto areas of land certain to become salinized or where clearing would damage downstream farms and water supplies. Prior to the Barnett government, WA did have a system that was working – with hundreds of well supported local landcare groups backed by good science and adequate funding, and with strong consultation mechanisms working between the grass roots and the various tiers of government. It is that history that we need to build on and aspire to – not the tragedy of denial and apathy that preceded it. *Andrea Gaynor is an Associate Professor of History at the University of Western Australia. An environmental historian, her research seeks to use the contextualising and narrative power of history to help address real-world problems. Her most recent book, co-edited with Nick Rose, is Reclaiming the Urban Commons: The past, present and future of food growing in Australian towns and cities (UWAP 2018). 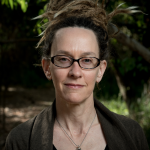 She is currently researching histories of Landcare in Western Australia, water in Australian urbanisation and nature in Australian urban modernity, and teaching world environmental history and Australian history. At UWA she is Chair of the History Discipline Group and Director of the Centre for Western Australian History; she is also convenor of the Australian and New Zealand Environmental History Network and endeavours to influence policy as a member of The Beeliar Group: Professors for Environmental Responsibility. 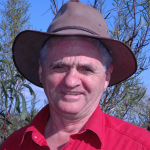 * Keith Bradby is a long-time advocate for the ecological values of south-western Australia. He has been involved with the landcare movement since its inception, and has had roles with his local landcare groups, in managing government programs and developing key government policies affecting landcare. As a businessman he has operated beekeeping and native seed businesses, consulted to the mining sector and worked in local enterprise development. He has authored many essays and scientific papers, plus one book on the environmental history of the Peel-Harvey estuarine system. Keith co-wrote and narrated the SBS documentary ‘A Million Acres a Year’. He conspired with friends to establish the Gondwana Link program in 2002 and serves as its CEO. Keith is also currently Chair of the WA Landcare Network and has consulted to large landscape conservation programs in New Zealand, southern Africa and Mexico. Keith was awarded an Order of Australia Medal in 2015 for service to conservation and the environment in Western Australia. How much should Australians know about Papua New Guinea?